Now every major vendor from Oracle to Genesys to Sitecore to IBM to every consultancy including McKinsey, Accenture, Cognizant and Prophet, and even marketing agencies and more, are helping enterprises around the world map customer touchpoints. As the act of outlining the customer journey through physical and digital touch points, which may or may not be informed by research. As the act of researching and charting the customer journey based on digital customer behaviour and trends. Some of the more progressive companies combine these two notions. You should research both the physical and digital journeys AND how customer behaviors and expectations play a role at each touchpoint. This high-level journey map illustrates how a customer could move through multiple touchpoints during the buying process. The journey as it stands (current state) – A current linear + cross channel view. The journey that could be optimised (future state) – Point A to Point X. The journey that should ultimately be (ideal state) – An omni-view of experience. The key difference between the first two and the third is that the first two involve iterating, and the third is more innovative in nature. You can see in the Oracle example that there are several hops that must be made between real life and various types of screens. All of these must be connected. Each channel plays a role in each moment of truth, so they should of course connect. In all journey maps, you ultimately create a detailed diagram that outlines the steps your customer/s undergo in engaging with your company during each moment of truth. But journey maps come in many styles. They can visualise a sequence of events. They can illustrate how a customer interacts with one part of your business. More elaborate maps also sketch out behaviors and activities post transaction. The best customer journey maps are those that are 1) illustrative in their own right and 2) actionable and inspiring. They must communicate the need to change and rally stakeholders to believe in and fight for transformation. Finally, they must create a sense of urgency about doing so. 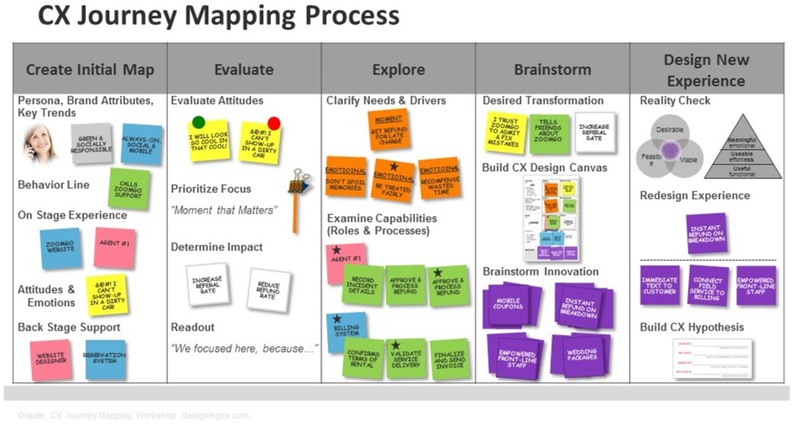 Customer journey mapping is something all businesses must practice. But there’s more required to capture the hearts, minds and wallets of customers. I believe that as we mature in our work around customer experience, we must now also consider every element of the experiences that we want people to actually experience. After all, it is customers who perceive experiences and as such, our work should be nothing less than human-centred. Yet many companies invest in CX through a technology, process and touch point POV. It improves things yes, but it ultimately misses opportunities for innovation and differentiation. Customer journey mapping is something all businesses must practice. But there’s more required to capture the hearts, minds and wallets of customers. What people feel and share influences the impressions, perceptions and actions of others. In fact, more and more consumers are expressing that they do not want products alone, they definitely don’t need traditional sales, marketing and support, they simply want great experiences. For example, a study by Harris Group found that 72% of millennials prefer to spend more money on experiences than on material things. And Gartner surveys show that customer experiences are the most pressing mandate for marketers. As Joe Pine and James Gilmore stated in 1999, we now live in an “experience economy.” But if everyone is working toward CX, what separates good from great? When I was writing my book X: The Experience When Business Meets Design, I struggled to find a basic but encompassing definition that could serve as the premise for experience design. When it comes to experiences, I’m not referring to stunts, campaigns, or clever gimmicks. What I’m referring to are the raw experiences that people feel, crave, and those that help people define who they are or what they accomplish after engagement. In their barest essence, experiences are events or occurrences that leaves an impression on someone. Experiences are felt, they’re sensed, in the moment and in every moment collectively, and they are measured by how someone reacts in each instance and ultimately assessed by the sum of experiences. Do you remember the last great experience you had? Do you remember how it made you feel? Can you recall what was so special about it? By bringing to mind these memories and bringing to life the emotions you felt, you start to unlock the elements of which you can use to design meaningful, shareable and unforgettable experiences for others. Doing so, sets the stage for a different, more human form of branding, marketing, product development, service/support and relationship building. Every brand is experienced whether they’re designed or not. I believe most brands however, leave those experiences to chance. But if experiences are felt, then we must also consider what it is we want people to feel, what it is we want them to sense, and more so, what it is we want them to do, say, or how it is they react. It’s a shift from focusing on not just impressions but also expressions. We need to invest in experience design. Doing so will take us beyond customer journey maps and venture us into new territory of experience architecture. Businesses must now be thoughtful and intentional about each encounter. This goes beyond traditional CX work and now starts to move into a new territory of experience design. CX is now in everything and every moment that defines the customer journey and what ultimately shapes and influences the customer lifecycle. Furthermore, experiences come to life in products, services, engagements, materials, packaging, support, product usage, et al. That’s customer experience. And as such, experiences require architecture. This is why I believe the future of CX makes your work more important that it was yesterday. Strategists must become experience architects and the very concept of brand, product, service, loyalty, et al., must now become supporting roles in a larger, more cohesive experience production. In the next article, Brian explains how to design experience flows.